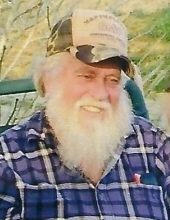 Mr. Mark Wayne Mitchell of Greensburg, Kentucky, son of the late Olie Robert Mitchell and Pauline McGinnis Mitchell, was born on Saturday, March 7, 1942 in Marion County, Kentucky and departed this life on Saturday, April 13, 2019 at his home. He was 77 years, one month, and six days of age. He had made a profession of faith in Christ and was a member of the Bethlehem Baptist Church. He was employed with Cox Interior for 20 plus years in construction and maintenance. Survived by his wife of 56 years, Linda Curry Lane Mitchell, having united in marriage on June 30, 1962. Other survivors include two daughters and sons-in-law: Lamanda Sue and Les Newcomb, and Traci Lynn and Tim Coppage all of Campbellsville; a son and daughter-in-law: Troy Wayne and Angie Mae Mitchell of Greensburg; nine grandchildren: Krystal Jeffries and her special friend, Stephen Newby, Misty and Brent Keith, C.J. Jeffries, Cody and Danielle Armstrong, Dawson Mitchell, Deven Mitchell, Cheyenne Milby and her special friend, Cody Harrington, Ashton Chelf, and Scotty Chelf; 16 great-grandchildren; six sisters and two brothers: Edna May Allne, Judy Williams, Betty Hourigan, Lucille Nichols, Margaret Clements, Carolyn Wise, Tommy Cornett, and Ray Cornett all from Lebanon; and a host of other relatives and friends. Mr. Mitchell was also preceded in death by a sister and six brothers: Christine Stergeon, Henry Wayne, Jr. Wayne, Jasper Wayne, Isaac Cornett, Hubert Cornett, and Robert Cornett. There will be graveside services for Mr. Mark Wayne Mitchell held at 11:00 A.M., Central Time, Tuesday, April 16, 2019 at the Bethlehem Cemetery. Bro. Red Johnson officiating. Cowherd and Parrott Funeral Home in Greensburg in charge of the arrangements. Memorials are suggested to the Bethlehem Cemetery, which can be made at the funeral home. To plant a tree in memory of Mark Wayne Mitchell, please visit our Tribute Store. "Email Address" would like to share the life celebration of Mark Wayne Mitchell. Click on the "link" to go to share a favorite memory or leave a condolence message for the family.